Regardless if you play online multiplayer games a lot or not, it’s no fun having to play against cheaters. Sad to say though, there will always be those who not only cheat in online games, but also profit from it by selling cheats. Well, thankfully, the story we’re running now mentions how this kind of individual can be deterred to the point that they stopped. 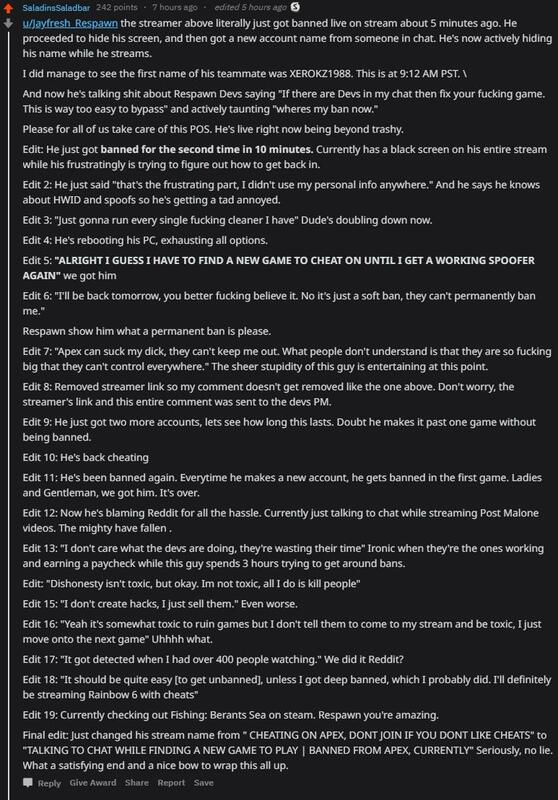 Over on the Apex Legends subreddit, user microKEEL posted a blow by blow account of an Apex Legends cheater — who streamed and bragged about his cheating — get banned, taunt Respawn, get banned again, until he stopped! Respawn Entertainment Associate Producer Josh Medina even hopped on the subreddit saying that this was how he spent his 45 minutes this morning (from banning this dude again and again). Hopefully, this dude just stops his cheating ways, though it’s highly unlikely. If that’s the case, let’s hope gets banned (hardware ban might be best for people like these) in other online games where he wants to cheat — and sell cheats — in. In other Apex Legends news, Respawn has acknowledged the Battle Pass XP bug on the PS4 version of the game, as well as issues reporting players. In the meantime, we highly recommend a trustworthy and efficient website to anyone with desperate needs of substantial Apex Coins, this is the place where you can browse, check, shop and get your merchandise quick, safe and at a reasonable price.